Abstract: The visual appearance of many materials is created by micro-scale details of their surface geometry. In this paper, we investigate a new approach to capturing the appearance of metal surfaces without reflectance measurements, by deriving microfacet distributions directly from measured surface topography. Modern profilometers are capable of measuring surfaces with sub-wavelength resolution at increasingly rapid rates. We consider both wave- and geometric-optics methods for predicting BRDFs of measured surfaces and compare the results to optical measurements from a gonioreflectometer for five rough metal samples. 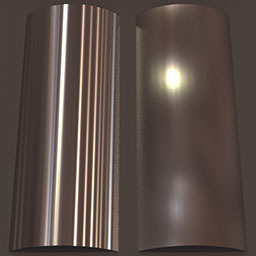 Surface measurements are also used to predict spatial variation, or texture, which is especially important for the appearance of our anisotropic brushed metal samples. 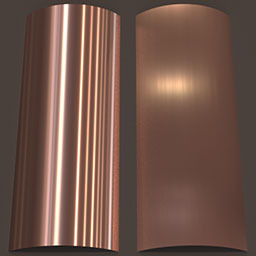 Profilometer-based BRDF acquisition offers many potential advantages over traditional techniques, including speed and easy handling of anisotropic, highly directional materials. We also introduce a new generalized normal distribution function, the ellipsoidal NDF, to compactly represent non-symmetric features in our measured data and texture synthesis.